Automatic Failover adds Zookeper Quorum and ZK FailoverController process components to an HDFS deployment. The preceding sections describe how to configure manual failover. In that mode, the system will not automatically trigger a failover from the active to the standby NameNode, even if the active node has failed. This section describes how to configure and deploy automatic failover. ZKFailoverController process (abbreviated as ZKFC). Health monitoring: ZKFC periodically pings its local NameNode with a health-check command. 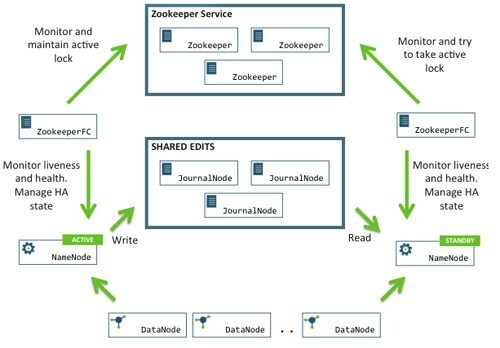 ZooKeeper session management: When the local NameNode is healthy, the ZKFC holds a session open in ZooKeeper. If the local NameNode is active, it also holds a special "lock" znode. This lock uses ZooKeeper's support for "ephemeral" nodes; if the session expires, the lock node will be automatically deleted. ZooKeeper-based election: If the local NameNode is healthy and no other node currently holds the lock znode, ZKFC will try to acquire the lock. If ZKFC succeeds, then it has "won the election" and will be responsible for running a failover to make its local NameNode active. The failover process is similar to the manual failover described above: first, the previous active is fenced if necessary and then the local NameNode transitions to active state. Make sure you have a working Zookeeper service and you shut down your HA cluster before you try to configure and deploy automatic failover. Set up the database and configure Oozie on two or more servers and start the Oozie servers.